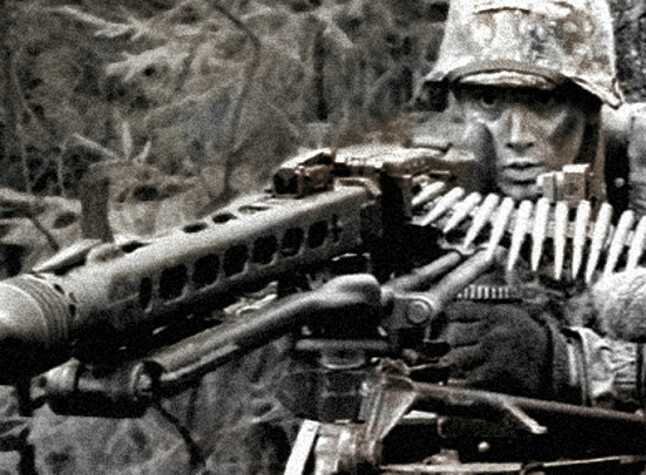 The MG 42 (shortened from German: Maschinengewehr 42, or "machine gun 42") was a 7.9mm general purpose machine gun that was developed in Nazi Germany and entered service with the Wehrmacht in 1942. 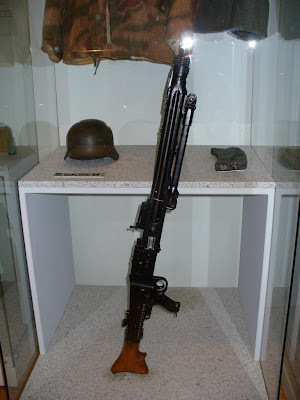 It supplemented, and, in some instances, replaced the MG 34 general-purpose machine gun in all branches of the German Armed Forces, though both weapons were manufactured and used until the end of the war. The MG 42 has a proven record of reliability, durability, simplicity, and ease of operation, but is most notable for its ability to produce a stunning volume of suppressive fire. 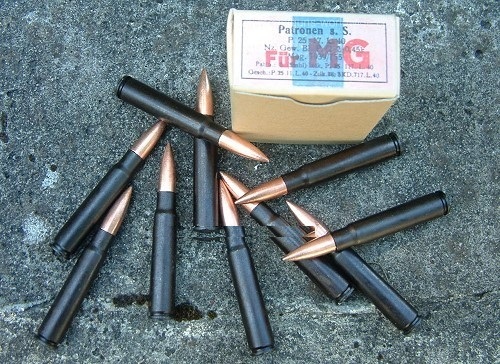 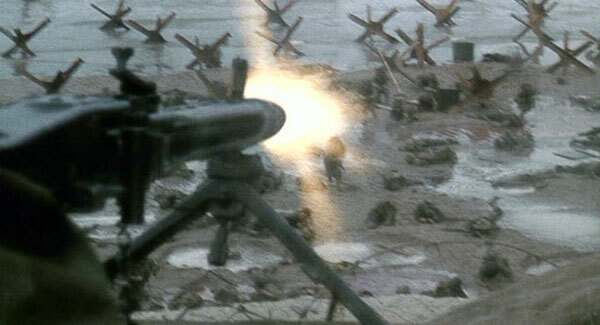 The MG 42 has one of the highest average rates of fire of any single-barreled man-portable machine gun: between 1,200 and 1,500 rpm, which results in a distinctive muzzle report. 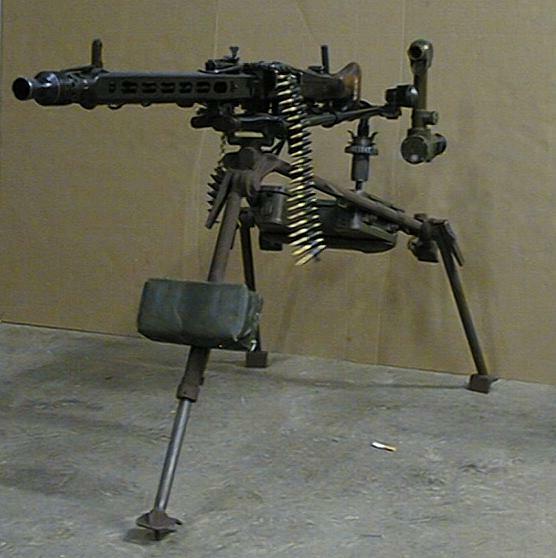 There were other automatic weapon designs with similar firepower, such as the French Darne, the Hungarian-Gebauer single-barreled tank MGs, the Russian 7.62mm ShKAS aircraft gun and the British Vickers K machine gun. 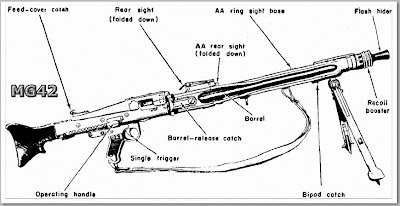 However, the MG 42's belt-feed and quick-change barrel system allowed for more prolonged firing in comparison to these weapons. 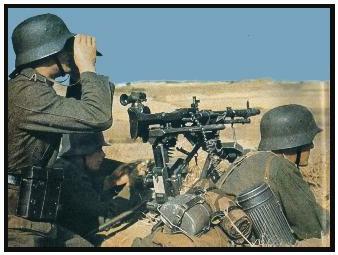 During the 1930s the German Army introduced the MG 34, considered to be the first modern general-purpose machine gun. 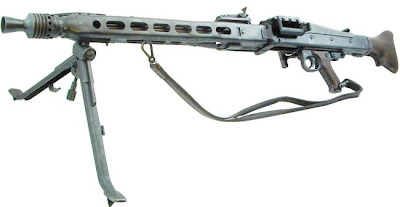 Equipped with a quick-change barrel and fed with belts or large magazines, the MG 34 could fire for much longer periods of time than weapons such as the American Browning Automatic Rifle, Japanese Type 11, British Bren and French Châtellerault LMG, while being much lighter than crew-served weapons like the Vickers machine gun and M1917 Browning machine gun. 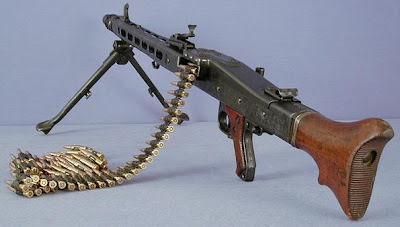 The weapon was also quite versatile. It was able to be fed from belted ammunition and a saddle drum magazine (the feed cover had to be changed for magazine feed) and fired from heavy tripods or various pintle mounts for armored vehicles. It even became a primary defensive gun for the Luftwaffe, in its MG 81 form, and as secondary armament on tanks as the MG 34 Panzerlauf. 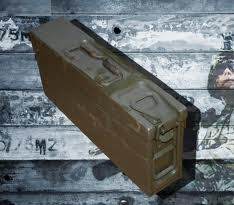 However, it did have its drawbacks, such as sensitivity to dust and comparatively expensive production. 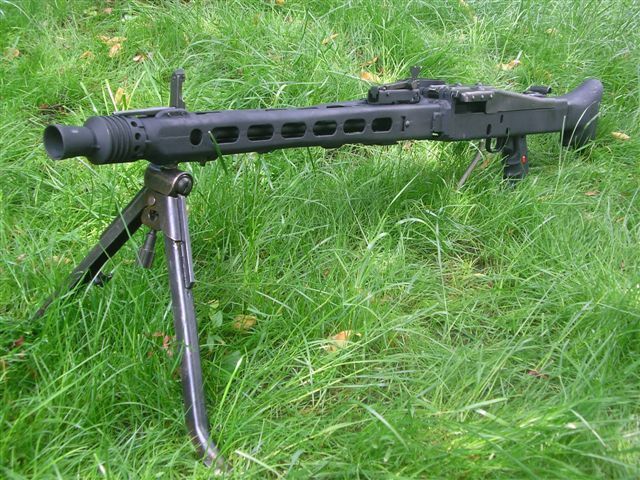 One attempt at improvement was the MG 34S, an incremental improvement on the basic 34 design. 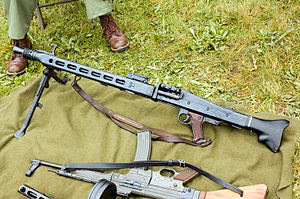 The MG 42 is roller-locked and recoil-operated (short recoil) with gas assist. 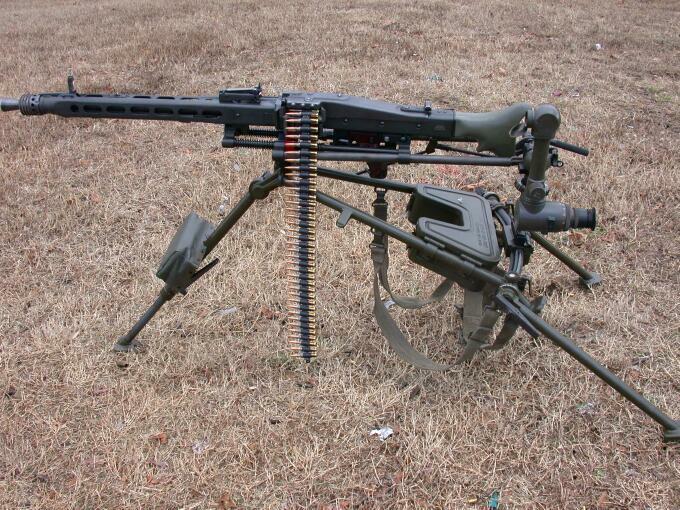 It fires belt fed 7.92mm ammunition from an open bolt. 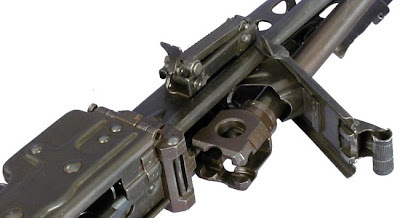 The roller-locked bolt assembly consists of a bolt head, two rollers, a striker sleeve, bolt body, and a large return spring, which is responsible for pushing the bolt assembly into battery (the locked position) and returning it there when it is unlocked and pushed backwards by the recoil of firing or by the charging handle. 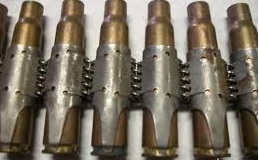 As the striker sleeve is movable back and forth within the bolt assembly, the return spring is also responsible for pushing the striker sleeve forward during locking (described below). The bolt assembly locks with the barrel's breech (the end the cartridge is loaded into) via a prong type barrel extension behind the breech. 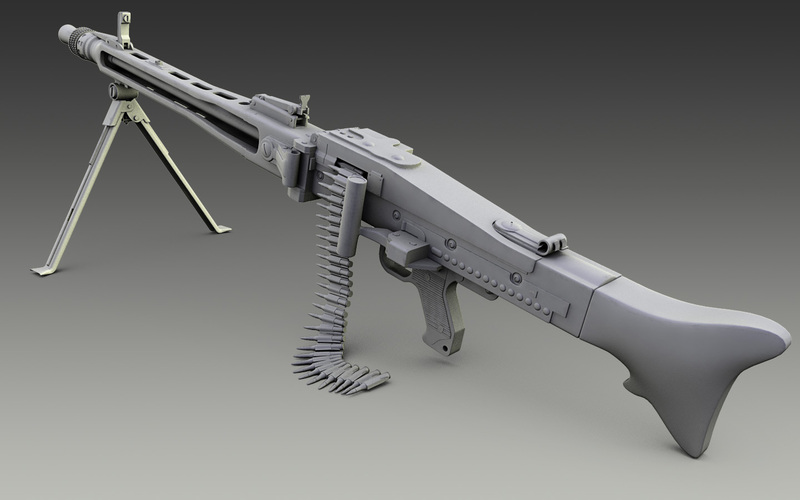 As it is recoil-operated and fired from an open bolt, the weapon must be manually charged with the side-mounted charging handle. The roller-locked recoil operation functions as follows: two cylindrical rollers, positioned in tracks on the bolt head, are pushed outwards into matching tracks in the barrel extension by the striker sleeve and lock the bolt in place against the breech. 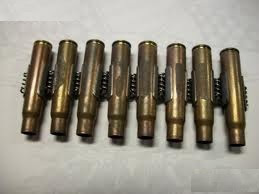 Upon firing, rearward force from the recoil of the cartridge ignition pushes the striker assembly back and allows the rollers to move inwards, back to their previous position, unlocking the bolt head and allowing the bolt assembly to recoil, extracting the spent cartridge and ejecting it. 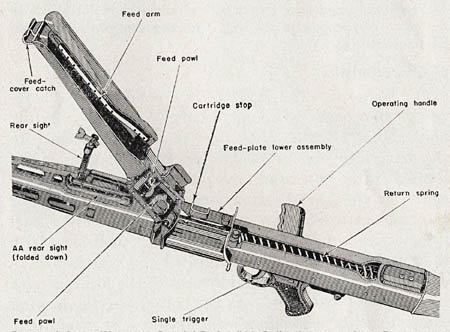 The return spring then pushes the bolt assembly forwards again, pushing a new cartridge out of the belt into the breech, and the sequence repeats as long as the trigger is depressed. 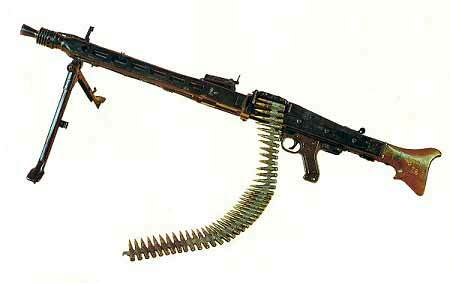 The MG42 is only capable of fully automatic fire. Single shots are exceptionally difficult, even for experienced operators, due to the weapon's rate of fire. 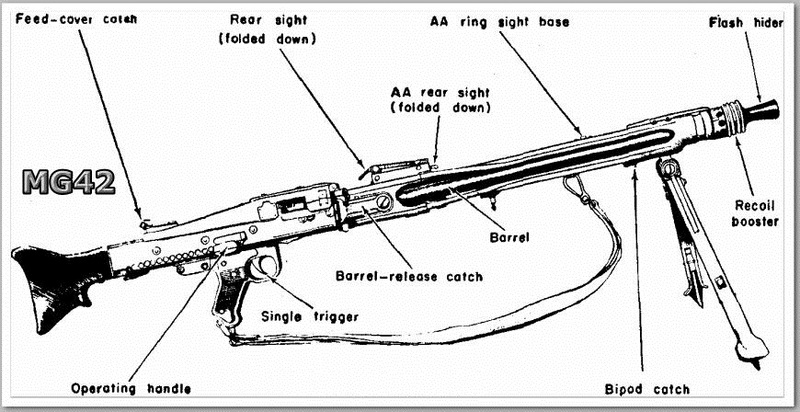 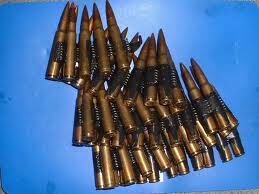 The usual training objective is to be able to fire a burst of no more than three rounds. The weapon features a recoil booster at the muzzle to increase rearwards force due to recoil, therefore improving functional reliability and rate of fire.